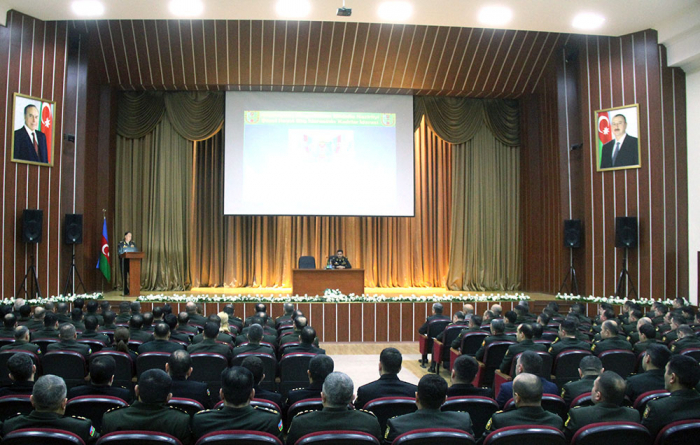 According to the combat training plan for 2019, approved by the Minister of Defense Colonel General Zakir Hasanov, methodological training sessions were conducted with the staff of the Personnel Bodies of the Army Corpses, formations, military units, and special military-educational institutions. Before the beginning of the event, the memory of the national leader of the Azerbaijani people Heydar Aliyev and heroic sons who died for the territorial integrity of the country was honored with observing a minute of silence. Then the National Anthem of the Republic of Azerbaijan was performed. Lieutenant General Kerim Veliyev, Deputy Minister of Defense, speaking at the meeting, noted that reforms are being continued in the Azerbaijani Army under the leadership of the President of the Republic of Azerbaijan, Supreme Commander-in-Chief of the Armed Forces Mr. Ilham Aliyev. The Deputy Minister, noting that the Personnel Bodies are one of the essential spheres of service in the Ministry of Defense, emphasized the serious attention paid by the Minister of Defense to this area. The Chief of the Department for Personnel of the Main Department for Personnel Major General Elchin Khalilov spoke about the work done in the field of improvement of the staff of Personnel Bodies and brought to the attention of the participants the main forthcoming tasks.